Not the Mona Lisa you’re looking for. What it’s about: The most famous painting in the world, sort of. Leonardo da Vinci’s masterpiece may be the most imitated (and parodied) work of art in history, but the Museo Nacional del Prado is very likely displaying the original twin—an alternate painting of the same woman depicted in the Mona Lisa painted by another artist, possibly simultaneously with Leonardo’s work. 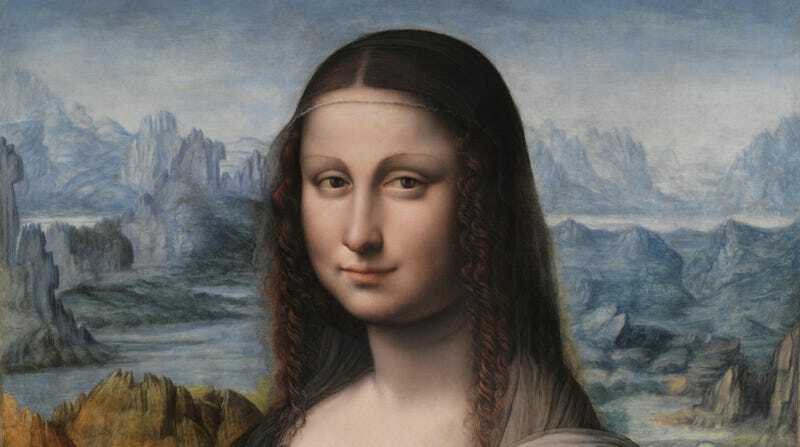 Biggest controversy: We suspect the Prado version of Mona Lisa was painted by an apprentice of da Vinci, probably working alongside him as he painted the more famous version. But it took 500 years to figure that out. The Prado painting is part of Spain’s Royal Collection, and has hung in the museum since it opened in 1819. At the time, it was thought to be a copy made a few years later. But from 2010 to 2012, the painting was restored. During the process, “a study of infrared reflectography and radiography” determined the painting was contemporary with the Louvre’s version, and had been painted in da Vinci’s workshop, because the underlying drawings were the same. Strangest fact: At some point, someone painted over the Prado painting. For nearly 200 years, it hung in the museum with a black background. But the recent restoration revealed that under that layer of black paint was a background similar to da Vinci’s, painted in a slightly different style. The black paint dated to the late 1700s; the rest to the early 1500s, when the more famous Mona Lisa was painted. Thing we were unhappiest to learn: We may never actually know who painted Prado’s Mona Lisa. Da Vinci had two pupils who are likely candidates—Francesco Melzi and Salaì. He also had two Spanish students—Fernando Yáñez de la Almedina and Hernando de los Llanos—which may explain how the painting ended up in Spain in the first place. Also noteworthy: There’s another other Mona Lisa. The Isleworth Mona Lisa was first noticed in 1913 by English art collector Hugh Blaker (who hailed from Isleworth in London), hanging in a manor house in Somerset. Blaker bought it from the owner, who claimed it was purchased in Italy and was a legitimate da Vinci painting. It’s been suggested that the Isleworth is in fact older than the Louvre’s version, and was a preliminary. The fact that the background is simpler seems to corroborate that theory. The Isleworth has passed through a few hands, including those of Henry F. Pulitzer, and is still privately owned and not on display to the public. Best link to elsewhere on Wikipedia: There’s also a Mini Lisa. In 2013, Georgia Tech PhD candidate Keith Carroll “painted” a replica of Mona Lisa that was 30 micrometers wide—a third the width of a human hair. He did so using a technique called thermochemical nanolithography, which we won’t pretend to understand, but it involves creating light and dark molecules to form a grayscale image. Further down the Wormhole: One more clue that the Prado Mona Lisa was painted in da Vinci’s studio is that, during the painting’s restoration, the frame was discovered to be walnut—an expensive wood that was a favorite of da Vinci’s—instead of oak, as previously believed. There are 600 different oak species found all over the world, and besides their wood being used for frames, oak trees have been the subject of art. The Proscribed Royalist, 1651 is John Everett Millais’ portrait of an English Royalist hiding in an oak tree to escape Cromwell’s army. Oliver Cromwell served as Lord Protector of England after Charles I was executed and the monarchy overthrown. Cromwell is a rare individual who has separate Wikipedia pages for himself and his head. We’ll find out why next week. Why do we care so much about the Mona Lisa?